Israeli Prime Minister Benjamin Netanyahu told a gathering of Brazilian Evangelical Christians on Sunday that they are the Jewish state’s best friends. Netanyahu is in a six-day visit to Brazil to attend the inauguration of Jair Bolsonaro as president. This is the first time an Israeli Prime Minister ever visits Brazil. Even though Brazil had several conservative Catholic presidents, no one of them was willing to get close to Israel. With Jair Bolsonaro, a nominal Catholic, was different, because his main voting base was evangelical. Netanyahu expects Israel’s relations with Brazil to improve because of the influence evangelicals have on Bolsonaro. Netanyahu told the Evangelical event: “President Bolsonaro says, ‘We are brothers.’ We are brothers, and we are going to seize the future together. Bolsonaro’s promise to move the Brazilian embassy to Jerusalem was a promise to please evangelical voters. It is not known if he is going to fulfill his promise as soon as possible or if he will keep endlessly postponing not to displease his evangelical voters. Even though World Israel News and other Israeli news outlets credit Brazilian evangelicals with Bolsonaro’s victory, after his election Bolsonaro stopped from giving evangelicals the main credit, which he now gives to revisionists of the Inquisition. The Inquisition had its dark hand in Brazil, which is today the largest Catholic nation in the world. In the last years, Brazilian Jewish authors have published several books on the suffering and death of Brazilian Jews caught in the dragnet of the Inquisition. Brazilian Jews were able to establish a holiday in remembrance to the Jews who suffered persecution and death under the Inquisition in Brazil. There is also the Brazilian Museum of the Inquisition, created by Jews. The Inquisition, which has a history of persecution and execution of Jews, including in Brazil, has been a flagship of several radical Catholic “conservative” groups in Brazil that advocate its revisionism. The most prominent Brazilian advocate of the revisionism of the Inquisition, Olavo de Carvalho, has had on Bolsonaro the same bad influence Steve Bannon had on U.S. President Donald Trump in the past. In fact, both Carvalho and Bannon are adherents of the Islamic occultist René Guénon. Eventually, Trump saw Bannon as an opportunist and expelled him from the White House. The hope and prayer of many evangelicals who voted for Bolsonaro is for him to see also that Carvalho is an opportunist and expel his influence from his administration. It is more than natural that the most prominent Brazilian advocate of the Inquisition sees the best friends of Israel as worse than Marxists. Antagonizing (something that the self-proclaimed “strategist” in the case of Trump never tried to do) evangelicals, the self-proclaimed “strategist” in the case of Bolsonaro has said, “Evangelical churches have done more harm to Brazil than the entire left has done.” Does it mean that he wants Bolsonaro to fight more now evangelical churches than the fight he had against the left? Does it mean that when evangelicals, who were victims of the Inquisition, embrace Israel and the Jews, who were also victims of the Inquisition, as their best friends, a bigger harm than Marxism will result? Dilma is the former Brazilian socialist president, impeached by an evangelical effort. Then, out of pure envy, for Carvalho to remove the “myth” of the Inquisition is infinitely more important than eliminating the left. If the Inquisition never existed, then does the multitude of Jewish books against the Inquisition spread lies? Or is the great liar Olavo de Carvalho, adherent and propagandist of another liar, the Islamic occultist Guénon? In 2013, Israeli Prime Minister Benjamin Netanyahu met Pope Francis at the Vatican, and gave the leader of the Catholic Church “The Origins of the Inquisition in Fifteenth Century Spain,” a book that largely revolves about Spanish Catholics questioning, torturing, and punishing the Jews, exposing how thousands of them were expelled from Spain or burned at the stake. The Jewish Journal said that “The Origins of the Inquisition in Fifteenth Century Spain,” a scholarly magnum opus and in-depth tome on the Spanish Inquisition, describes how the Catholic Church persecuted, and often executed, masses of Jews. 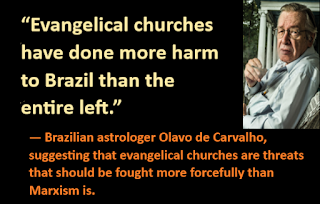 Evangelicals are a solid hope for the Bolsonaro administration, but the revisionists of the Inquisition and their opportunism represent a real challenge and threat. Yet, with evangelicals and their prayers, Brazil is having an excellent new beginning: With Israel at their side. With Netanyahu officially saying that Brazilian evangelicals are the best friends of Israel, Brazil is getting a great new chance to advance as a nation finding God’s blessings. I wonder if God will open the doors to Brazil in an extraordinary way. In 2008 I met American prophet Chuck Pierce, who told that if Brazil got closer to Israel, God was going to give to Brazil the anointing that the U.S. has lost. You can read about his vision in this article: Brazil, the Next (Regional or Global) Threat to the U.S. Economic Supremacy? Yet, I have a doubt about his other comment, “Evangelical community has no better friend in the world than the State of Israel.” Considering that the Israeli government, even under the right-wing coalition of Netanyahu, has advocated the homosexual agenda, would Netanyahu and his administration treat conservative evangelicals opposed to the gay agenda as friends or enemies? Only God can help the nominal Catholic Bolsonaro have a real encounter with Jesus Christ and protect himself and his administration from opportunists, especially the revisionists of the Inquisition. Only God can help Netanyahu also have a real encounter with Jesus Christ and become a real friend of conservative evangelicals who oppose abortion and the homosexual agenda, because there are no greater supporters of Israel than conservative evangelicals, and I am gladly one of them. My hope is the we conservative evangelicals, in our friendship with Israel, may have more and more influence on the Bolsonaro administration and that right-wing Catholics, who love the Inquisition and its revisionism (which is an obvious sign of clear or covert enmity toward Jews), may lose their influence on the Bolsonaro administration. The fight in Brazil now is more than socialism versus capitalism. It is the best friends of Israel versus the best friends of the Inquisition. With information from World Israel News.